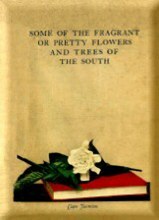 The articles in this book have been printed weekly in the Pass Christian Gulf Coast Beacon and it has been suggested to the Author that they be published in book form for the purpose of having a record of the native trees and flowers of the Gulf Coast and other plants that were originally brought from far off Foreign lands but which have become as if native born, and flourish here as thriftily as they did where they came from. It will perhaps also be of assistance to those who are not familiar with the flowers of this part of the country who have lately come here and now want to know what kind of flower to plant in the garden of their new home. All the pictures shown were made from photographs of the actual flower and trees and shrubs, growing in the gardens in this location. Any of the information given of the propagation of the plants will be suitable to cover a country bordering on the entire Gulf Coast, for out of door flower culture. If this little volume meets with approval, Volume 2 will be published and the list of plants will be enlarged and as perfect pictures will be made of the new flowers when they blossom forth in their regular season. (Special Note:) The text from this book was copied with permission of Mrs Joy Schneider who was kind enough to reproduce her copy to created these web pages for all to appreciate. The photos imbedded within the text below are not original to the Sherman book. However, posted at right are the photos in thumbnail. If the viewer wishes to see larger photographs, click on each thumbnail. The acorns are now falling from oak trees, and to hear them pattering on the roof of the house and on the ground, reminds me of that beautiful poem, "Only God Can Make a Tree." And in remembering how so many of the beautiful oak trees that children played under and have been cut down and destroyed, it makes me think of the children to come; will they have beautiful trees to play under? Yes, if every little boy or girl who can not, like God, make a tree, but who can be instrumental in growing one or more oak trees, whenever he or she finds an acorn lying under a tree and will take a stick and make a hole in the ground somewhere where they would like to see a tree growing for someone's little boy or girl in the future to play under, and put the acorn in the hole and cover it up with a little dirt, it can then grow in the Springtime, they can watch for the little oak tree to force its way up through the ground, and from time to time they can see it grow and it will be an inspiration to them to think and do other big things. Although they have not, like God, made a tree, they have been the means of its growing, for if they had not put their acorn in the ground and covered it up with some soil, it would have surely dried up or rotted on the ground or have been crushed under someone's foot. It becomes a growing tree through their instrumentality. The planting of an acorn is an inspiration for romance. Many beautiful stories have been told about the planting and growing of an acorn, and one of the stories that are often recalled reading or dreaming is about seven brothers. They were all making preparations to leave the old home, and on the eve of their departure, they gathered together with their mother and father in the shade of a live oak tree. The mother said: "My boys, you know it is not necessary for me to have anything to make rut: remember. you by, but each one of you get a good acorn, take them to that patch of ground that can be seen from my window, and plant them all together in clump, and mark each one with a stick with your name thereon, and when they grow up and you are away, that clump of trees will make me feel that you are all standing out there watching over your father and me." The Klondike Cosmos is a most satisfactory plant for it grows without care or attention, if planted in good ground. But with cultivation and a sprinkling of some kind of fertilizer, it will grow much thriftier, and produce many more and larger flowers. 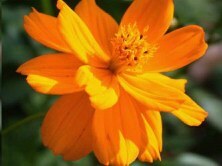 The flowers are orange colored and about two and a half inches in diameter with B petals. When the seeds begin to drop off the plant, if the soil is stirred up a little, so that the seed will sink in the crevices, they will have a better chance to grow. In the springtime plants can be thinned out and those pulled up be planted in some other place, where they can get plenty of air and sunlight. In the month of October they will commence to bloom and continue to do so until frost. This plant is of interest for there is no other Annual that will make more of a floral display in the garden with as little care as the Klondike Cosmos will. One plant near here grew to a height of 13 feet and then sent out its first blossom on the very tip end of the plant. Other blossoms opened up regularly downward until the whole bush was one orange colored glow. Another interesting thing about these flowers is that they are a great attraction for the butterflies. The butterflies by hundreds stay around these flowers all day long, and late in the evening, making an ever moving picture of beauty. The seeds are now falling and if anyone is desirous of planting same and can not obtain any, the writer will deem it a pleasure to send him some without any cost whatever, if he will send his name and address to him. 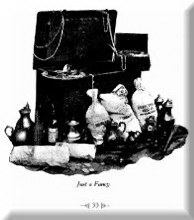 Years and years ago, before the days of running water in the home, it was a custom in most all homes to have a receptacle of some kind in which to keep the day's supply of drinking water, with a gourd for a dipper, or one made of pewter or tin. A cedar bucket with bright brass hoops was a great pride to those who" could afford that luxury. These cedar buckets were the first articles the writer remembers being made of red cedar wood. The common lead pencil was the next article, then a boat, a red cedar chest for the preservation of woolen clothes and furs from the ravages of moths, and now countless other articles are made of this wood. Take the lead pencil alone with the whole world's population whittling away cedar wood to get a sharp point of lead to write with, it should not take very much figuring to get some idea of when there will not be any more red cedar to make lead pencils of. To say nothing of the many other things, unless some action is taken to replace the trees that are being used up. 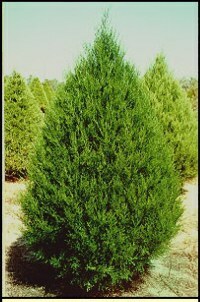 One cedar tree will produce enough seeds to plant acres and acres of ground. 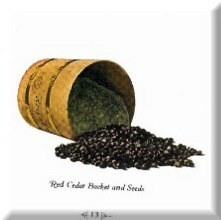 The seeds should be gathered in proper time and planted anywhere along the fence lines or roadways, scattered in furrows made through cut over pine land, or along creek banks and protected from fire. The first year they are hardly to be seen, but after that they grow rapidly and in four to five years the stalk at the base will be about 4 inches in diameter, and 10 feet high, and the branches 3 feet from the ground will form a circle 5 feet in diameter; so at the same ratio of growth, it will not take much more time to make a marketable log. If you want to plant for a lead pencil or a cedar chest, or one of those little cedar buckets made for children to play in the sand on the beach, and if you cannot obtain the seed, let the writer know and it will be a pleasure to see that you get some when they are ready to plant. If you do not want to plant for a pencil or a bucket, plant for a Christmas tree for your baby girl, or if it happens to be a boy, let him plant it for himself. 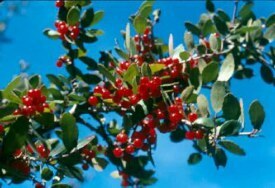 This shrub produces a berry about one-fourth of an inch in diameter. In the month of October, these berries commence to turn a red color and near Christmas time their color is a beautiful crimson, so bright that they are like crystal beads. This shrub is in all glory at Christmas time and it needs not the addition of any decoration to make it a gem of a tree for any gala Christmas occasion. The berries remain on the tree for several months and even when the branches are cut off for festooning, the berries stay on the stem for a long time. It is not a Don Quixote idea to establish an Arboretum for the growing of this shrub for Christmas decorations and Christmas trees. It surely would be a source of much profit. There should be no fear that there would not be any demand for them, for as long as there is a Santa Claus, trees will be wanted by him to hang the toys on for the children in the home. There will always be a Santa Claus. Some homes are without children to run around a toy covered tree at Christmas time. The writer was invited to such a home not many years ago at Christmas time and there he found a Christmas tree in the living room covered with wax candles and gold and silver spangled ribbons, fruits, and candy and candied covered cookies, and there was some little ribbon tied bundles hanging on some of the branches. Santa had brought these little bundles, for there was some one in that house he could not forget. The Yucca aloidolia is a plant of much interest to visitors to Pass Christian and many questions are asked about these attractive war like looking bunches of bayonet pointed leaves. It flourishes vigorously in this high sandy soil, although not a native of the Coast. The desert is its real home and it thrives there where only buffalo grass and cacti grow naturally. 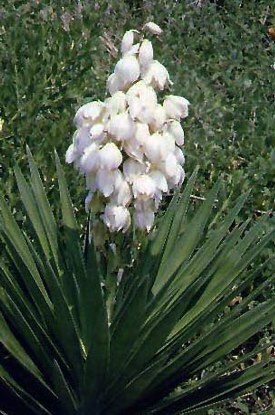 There are several varieties of the Yucca and many different names for it, the common name being the Spanish Dagger, but in some places it is Adam's Needle and still in others, God's Candle, from its likeness to a large candle, with its three foot spike of pure white cluster of bell shaped blossoms. It is also named "tree cabbage." The author on a trip down the Rio Grande River in an automobile, came up with a Mexican driving a team of oxen drawing a wagon loaded with dried goat skins, on top of the skins was a pile of large slabs of prickly pear and a bunch of some kind of green stuff. Inquiring of the Chauffeur as to what this green stuff was, he said it was tree cabbage or the green flowers of the Yucca. When it first blossoms out, the man, he said, gathers the blossoms on his way over the prairie and when he gets hungry, he stops and boils the green Yucca flowers like cabbage and eats it. He will burn the sharp needles off the prickly pear and feed it to his oxen. The Yucca is also called soap weed, from the fact that the root when pealed free of the skin, is a white pulp and if the hands are washed with it, it feels just like soap, and it is said that some natives use it for that purpose. 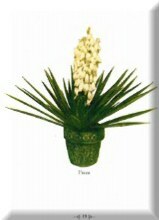 The Yucca can be grown from seeds or by taking up the old plant breaking off the sprout forming roots and planting them. Wonderful and beautiful are the native vines in this garden spot of the Gulf Coast. Would it were possible to paint a word picture like a great artist with his brush paints a picture of a peach so natural that it makes you feel when you see it that you want to rub the fuzz off of it and see the brighter color beneath, then it would be possible to describe the beauty of at least one of these native vines. The first sight of this vine when it was in blossom, had the appearance of an enchanted carpet of a beautiful creamy, salmon color that had floated through the air from some far off fairy land and had settled down on top of a cedar tree as if to land its fair passengers who had come to this, the spot next in beauty to their own fairyland home; and they must have liked the place very much, for the floral carpet remained here for many days before it took its departure. Perhaps it will come again next spring. There are only two stems to this vine growing up from the root, yet the top of the tree is thickly covered with the branches from these two stems. The vine is an evergreen and the leaves are arranged with two small lancelated leaves on short petioles to a single stem opposite to each other; tendrils come out from the angle of petioles, and stem is rounded, but flat at leaf connections. 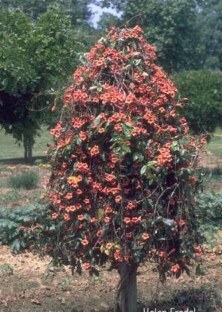 The flowers are similar in shape to those of a Bignonia and are variegated color, white and red. The vine is a rugged grower and needs no care or attention. It will find its own way up any tree, but it seems to prefer the cedar, clinging by its tendrils and after it has reached the branches and its weight can be maintained from the branches, its tendrils have no use and the vine is easily blown away from the tree trunk and dangles loosely, like any wild vine of the woods. It is not affected by heat or cold. A research is being made for the name of this vine and if it is really native of the Gulf, or whether it has been brought from some other location. Bignonia capreolata is the Botanical name of the pretty vine. We are indebted to Dr. Pring, chief Botanist of Shaws’ Botanical Garden of St. Louis, Mo., for the identification of this pretty flowering vine. The blossoms commenced to open on the 23rd of March and today, the 26th, a majority of the buds have expanded and a few blossoms have already fallen off the vine. So if any flower lovers are interested in this vine, and want to see it at its best, they will have to be at the Log Cabin in a day or two. This vine is a Native of Argentina. 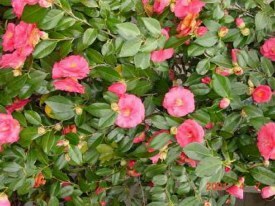 It produces myriads of trumpet shaped blossoms of a red color underneath and a light salmon color on the face, or top. After a careful search, only two seed pods could be found on this vine and these two pods contained 76 winged seeds, one and one-half inches long. The pods are eight inches long and three-fourth inches wide. The odor of the flowers is not at all pleasant. 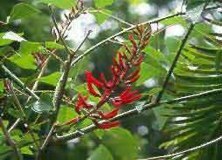 The Erythrina Herbacea is a plant native of this Gulf Coast and it is found almost everywhere among the wild shrubs in the woods or the pine trees in this location, but only a plant or two is to be found at anyone place. In the winter time this plant is killed down to the roots, and in spring it sends up several spikes of tube-shaped scarlet blossoms, a fit setting for any location in a flower garden. This plant produces seed pods, each containing several crimson colored beans that are something pretty to look at and if punctured and put on a string they would make a necklace that would stand comparison with the prettiest glass beads. Although it is not likely that one would chew on the beans because of an unpleasant taste, it is wise to warn against doing so because of their toxic effect on a person. When transplanting these plants care must be taken when digging them up not to pull on the stems, for the root is pulpy and the stems are easily broken from the crown of the root. This plant commences to send out leaf stems when the flowers have shed their luster and remain an attractive bush until frost. The leaves are a light green color and trident in shape, and there are three leaves on each stem, arranged in a tri- dent-state order. When a plant of this order is set out in the garden it will take care of itself and its gay crimson flowers will be among the first to appear in the garden in the spring. One of the great delights of life is to plant a flower or vegetable or fruit of some kind and watch it grow to maturity and enjoy the beauty of the flower, or the lusciousness of the fruit if it be a peach or a juicy watermelon. Such a delight is a great incentive to do something big and planting a flower or fruit is something very big if we only consider how far reaching the power of a flower or fruit can be in giving pleasure to those who cannot walk out in a garden or pluck the fruit off the tree in the orchard. This brings to mind a story of the departing of a well loved man. The floral tributes came in great numbers and some of the prettiest were placed on the casket. An old man dressed in his working clothes came into the room and stood by the coffin. He had a white rose in his hand. After viewing the remains for a while, he turned to the wife of the deceased and said, "He was my friend and this is all I had to bring," and he handed her the bud. Thanking him for the flower she turned and placed it on the casket and then removed all the other flowers. The twang of the heart strings of those who saw this occurrence cannot be sounded. The writer remembers the pleasure it gave him when a Mirliton he had planted produced its first fruit. It hung like a large ivory pear-shaped ear drop from the vine. The Mirliton is a vegetable similar to the squash. It has no seeds like the squash. It is just a big seed itself. The writer, when planting a Mirliton, either green or white, lays them on the side in the soil with the stem end at the surface of the ground and the other end about three inches deep and then covers them with good, rich soil. Two or more Mirlitons should be planted six or more feet apart to assure perfect pollination by the bees and the butterflies or other insects. If the Mirlitons are started early in the open ground on the west side of a barn or house where they can get the noon and evening sun, they will be sure to produce a bountiful supply of fruit. It is a very remarkable climber. The writer has a Mirliton, grown on a vine in Pass Christian, which produced more than a bushel, the measurements are: 12 7/8 inches in circumference around its side; 4 1/4 inches wide; 5 7/8 inches long and weighs 1½ pounds. The Mirliton is not a native of the Gulf Coast, but this sample will show that it can be grown to perfection here. Some interest should be taken to produce them along the Coast for the time will surely come when there will be a demand for them when the people of the north learn their value. The Mirliton is a vegetable and can be cooked in any way that a common squash can be prepared and as it is a good keeper, it can be had when squash cannot. It can be cut in half and seasoned and baked, or it can be peeled and boiled and cut up in little cubes, and it makes an excellent addition to any fruit or vegetable salad. The number of ways it can be prepared are unlimited. The botanical name of the Crape Myrtle is Myrtus Communis. A few miles from Pass Christian, Mississippi there is a fine lot of different kinds of trees growing on the highest land along the Mexican Gulf Coast from Pensacola, Fla., to Corpus Christi, Texas. In the center of which was once a yellow pine forest, but is now only cut over lands with myriads of burnt pine stumps. In the midst of these undisturbed trees are a number of Crape Myrtle shrubs or trees, for they are designated neither as a shrub or tree. A stranger coming to this part of the country and first seeing the large numbers of white, pink and crimson colored flowered Crape Myrtle trees growing around the homes and on the side walks of the beach boulevards, and afterwards seeing the myrtle trees growing in that clump of woods would naturally come to the conclusion .that the Crape MyrtIe was a native of this location, but it is not. It is a native of South America and Australia and of the Mediterranean Sea region. Where the bunch of Crape Myrtle trees are growing, out on what once was resin top of this part of the world, was evidently the home site of some flower loving couple who had brought the young trees from their native home and planted them there on the highest land, for a distance of 871 miles on the Gulf Coast. The myrtle will grow from cuttings of the young wood, but it will be more satisfactory to separate rooted shoots from the main stock and plant them. They can also be grown from seed, which are produced in small globular pods that are divided into five or six and some times more compartments, each containing one or two seeds. How those myrtle trees came to be growing out there in that oasis of what was once a sea of pines is a mystery. It is to be regretted that some romancer has not passed that way for he would surely have woven a story of love or an enchanted tale of some daring pirate who had made that spot his home and the hiding place for his spoils of silver and gold and precious stones. The very atmosphere there seems charged with romance and a feeling one experiences while strolling through that wonderful growth of trees is that he has only to scrape the surface of the leaf covered ground to unearth an old iron bound chest filled to overflowing with jewels. There is even now a hole in the ground at the foot of a tree as if somebody had been digging for hidden treasure. Those far from home trees might have been planted there to mark the spot where some treasure was buried. The Crape Myrtle according to Ancient Greek History derived its name from "Myrsine," a favorite of Minerva, and when she was transformed into this shrub, it was consecrated to Venus, and elsewhere it typifies Might, Power, and Glory, is sacred to Venus, and a symbol of Youth and Beauty, it signifies Love. The berries it produces are aromatic and are used in Medicine. 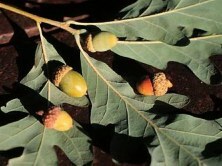 The leaves contain a volatile oil and were used as a stimulant by the Ancients. 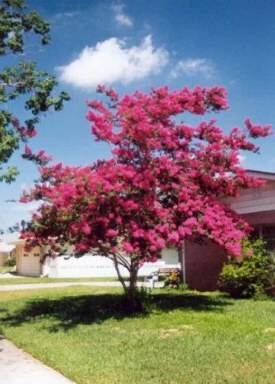 Perhaps there has been more written or as much about Crape Myrtle as any other shrub or tree. Not very 1ong ago a road was graded over this hill which leads by the above .mentioned bit of woods, down to the water's edge of the Bay of St. Louis, named after Louis IX, King of France. At the end of this road a story has been written with bricks and mortar and steel and landscape gardening, in such an incredibly short time that it could not be excelled except by a genii, summoned by a lamp polishing order of an Aladdin. If there was such a thing as Royalty among flowers, the white Camelia Japonica would surely be the Queen. The Camelia seems to have been jealous of the handicraft of man in imitating natural flowers with wax, for the Camelia is more like a wax flower, both in foliage and in blossom than any other flower. 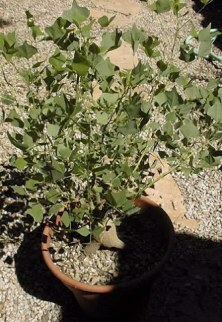 It is an ever green shrub with dark green waxy leaves. The white blossom petals are like they were carved out of white ivory. The blossoms when cut off the bush remain in nice condition for several days, but there is one thing that many other flowers can boast of that the Camelia can not, and that is it has no fragrance. The propagation of the Camelia is comparatively easy, however, you must put your heart in the work and study to be successful. They can be propagated from cuttings in the fall or early spring, from the new wood, or they can be grown from layers, that is, laying a shoot which is close to the ground in a trench, first cutting some of the bark from off the stem where it is bent down to layer, covering it up with dirt and holding it down in the soil with a forked stick driven into the soil. On examination, if found that they are well rooted by fall, the layers can be cut from the stock, but they should not be removed till Spring. The roots will grow out at the place on the stem where the bark had been removed. The sight of a Camelia Japonica is like a key and spring to unlock and throw open the gates of memory, and to let out a pageant of flowers, fruits, trees, fans and books, like a carnival parade, with recollections of experiences and banquets beyond an adequate description. 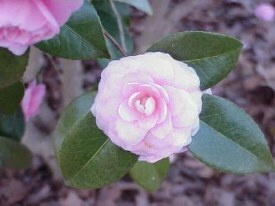 The Camelia Japonica and the dandy-trap reigned about the same time in New Orleans. That was before the days of granitoid. A dandy-trap was a loose brick in the sidewalk after a rain. When this brick was stepped on, the water would squirt up onto the leg of whoever stepped on it, to the great delight of those who saw it, especially if the unfortunate one happened to be decked out for a ball or other entertainment. In those days my step-father took me with him to a banquet at the St. Charles Hotel. General Jefferson Davis, President of the Confederacy, was seated at the head of a long banquet table reaching the entire length of the dining hall, and my step~father was at the other end of the table. To the left of my step~father right in front of us was a large punch bowl filled with punch. My step-father, without my knowledge had placed his silk hat under the table near my chair. During the course of the repast, he asked me to hand him his hat. In reaching down for the hat and taking hold of it by the rim it turned over and a bunch of Camelias with several cigars slipped from it into the punch bowl. Here a wreath of flowers in memory of my step-father should be hung for his great goodness, for that was not the last time he took me with him. The arrangement of the banquets then were so different from what they are now. On entering the dining room at that feast, the sights of great platters of food placed on tables around the wall to be served is one to be remembered. As we walked around the rooms looking at the great array of dishes of food that were to be served to us, there was a salad with ~ a lobster of great size spread out over the garnishings in a very large platter. You can only see such large platters now in the antique shops. “Memory! Memory! What a friend thou art and how often you are neglected.” A few years ago the Narrator noticed a pink flowering Japonica bush in a garden in New Orleans. From outside the fence he counted more than 250 blossoms on that side of the bush, and it looked as if there were just as many blossoms on the other side, or more than 500 blooms on the bush.. 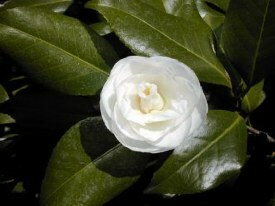 The white Japonica flower, is sold for one half of a dollar at florist shops. Of course it is not to be expected that all of the blossoms of a Camelia mature to a marketable condition, but if only a few on a large bush grew to perfection, and if only a fourth of the above named price was to be had the profit of the tree would be greater than is to be had for the wheat or corn grown on an acre of ground. The red, white, pink and variegated colored Camelia Japonicas are now in bloom in all their grandeur in the gardens in this section where they grow most prolifically. If you have not a Camelia of some color, buy one and help to make your community more beautiful. In this article the writer has wandered from his usual floral path, but a recollection of years ago about Beans comes up at this time and crowds out the flowery subjects, so this is being given instead. There must be a reason; perhaps it is because it is coming time to plant beans. The bean follows the grasses in importance in this world, for it is found in some form or another over the entire earth, and in more places than any other vegetable. There is some wonderful reason for this fact. Some years ago, there was a lot of land at my service and it was just impossible to refrain from turning to a boyhood hobby for making a garden. Beans was a favorite dish of mine, so some were planted, and after a time more, but of another variety. Seeing a new variety of seeds aroused the desire to plant every variety obtainable. There were red beans, white beans and yellow beans. Did you ever hear the song about beans? Well, if you did, that was the number of beans planted in that idle spot of ground on the Bank of Hinkston Creek in Missouri. All the beans grew and produced a most bountiful crop. They were of the variety known as Bush Beans, because they do not require a support. All of the beans on the bushes were left to mature and when they were ready to gather, the bushes were pulled up and stored in an unoccupied hay- loft to thoroughly dry. They were then threshed out and taken to the house and the vines were given to the cows to eat. The loft floor was swept up and the remaining beans, with the dry soil from the roots of the vines were piled up and forgotten until along in the summer time of the next year; then it was noted that the pile of beans had settled down and spread out for some distance on the floor. Some of the beans seemed to move, but on closer examination it was discovered that the movement of the beans was caused by different kinds of worms. There were red worms, white worms, yellow worms, mottled worms, and after a very careful separation of the different kinds of beans and worms, it was found that there was a worm to match every variety of bean and to resemble it in its characteristics, in shape and length. There were long worms, short worms and stubby worms, of the different colors of the beans. None of the beans were wormy, they were all perfect and sound, and whatever caused the life of those insects had nothing to do with the internal construction of the bean, but was a matter entirely on the outside and was the co-operation of the different elements to create life, and the stamping of each bean with its color and characteristics by one of nature's most wonderful powers. 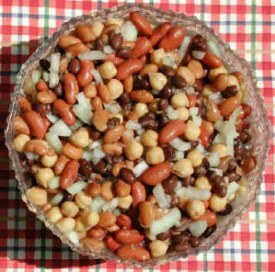 When ever the subject of Beans Comes up, my thoughts go back to the time of yeast and bread making. This was before the product of the distillery was sold so extensively for yeast for raising dough to make bread. A neighbor surprised me with a wonderful loaf of bread, and on inquiring about what kind of yeast she used, she said she had made the yeast herself with beans, and told me how to make it. 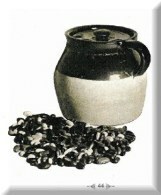 So it was tried out, by getting about a half dozen navy beans and pounding them into small pieces and putting them in a common sized drinking glass, which was half full with flour, and two teaspoonfuls of sugar, then stirred with lukewarm water to a thin batter and covered over with a thin cloth, and set away in a warm room. The fermenting commenced over night and the flour raised up in the glass to near the top in a couple of days. Half of the quantity was taken out and used for rais- ing a small batch of dough to make up a nice sized loaf of bread. A little more flour and more sugar was added to the remaining yeast in the glass and it was set away for the next baking. Of course there will not be a crowd rushing to try this experiment out, and it is brought up only to show the strange workings of nature. It is now conceded by men of knowledge that fermentation of some kind or another is the cause of all living things. The Michelia, history records, was named after a Florentine botanist by the name of Micheli. It is a beautiful ever-green shrub, with smooth, stiff leaves about three and one-half inches long. It must not be confused with the Magnolia Grandiflora tree of the South, with its magnificent, glossy-green leaves and great white blossoms. The actual size of a leaf of the Magnolia Grandiflora now before me is nine and one-half inches long and three and three fourth inches wide, and the flowers are as large, if not larger, than the dimensions of the leaf. There are many species of the grandiflora, and the Fuscata is one of that family and it is a native of China. The Fuscata blossom is similar in shape to the Grandiflora, but it is of a creamy color. Some of the blossoms appear in April, and some are to be found on the bush as late as June. The fragrance of the Fuscata flower is very much like the odor of a very ripe banana, and for that reason history refers to it as the Banana Shrub. On a sunshiny day the atmosphere around a Fuscata bush, for a great distance, is charged with the delightful essence of its small blossoms which are not over one and one-half inches in length, but what a power it has to bring forth expressions of great joy to those who for the first time catch a whiff of its perfume. Years and years ago, somewhere, it was the custom to observe New Year for Trees. At the "Anniversary of trees," which occurred at a time corresponding to our February "Plant of Joy" was planted.. This plant of Joy is not clearly identified in history, so the thought came to me when that whiff of air, laden with that inspiring breath from the flowers of the Fuscata bush was blown over the fence that the Fuscata might have been the "Plant of joy." It would be a nice thing to revive that old custom, and name some shrub the "Plant of Joy". 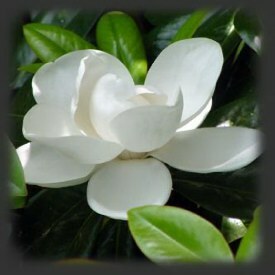 The Magnolia Fuscata is well qualified to receive that honor even if it was not the original "Plant of Joy." It would at least cause more interest to be taken in this shrub, so that more of them would be planted. It was a great temptation for him to buy one of the cornucopias, but he would not buy even a sheet of Ju Ju paste. He caught a whiff of the Fuscata flower, so he must have a Fuscata bush. He remembers well when he went to the florists to buy the Fuscata bush. The florist's wife picked out the largest bush she could give him for his dollar. It was only one twig, not a foot high, in a very small flower pot. He planted it, and it grew up into a very beautiful shrub, and was actually a "Plant of Joy" to him. A few days ago this same boy, now grown up, bought another Fuscata bush. Pot and bush together measured sixteen inches in height. There are two branches, ten inches long, and the plant cost one and one-half dollars. They can be grown from seeds but it takes a long time for the seeds to germinate. They can be propagated by layering. It was the writer's good fortune lately to receive from the patent office at Washington, D.C., a reference pertaining to an application he had made for a patent, and showing photostats of the British patent claims and illustrations, that will be particularly interesting to anyone who is anxious to propagate any shrub or bush. "The Chinese ring a part of a branch and then fasten around it a large ball of clay, cleanings from a cow stable well incorporated, and similar to our grafting clay, and the whole is maintained in a moist state by means of a vessel placed above it, and kept supplied with water of which enough is allowed to escape by a small hole at the bottom." God must have intended this part of the Gulf Coast as the propagating ground for the Fuscata, the Camelia, and the many other flowering shrubs now here and grow- ing as thriftily as in their native places, for He put a great reservoir of water somewhere on a high elevation north of us and made a passage way through the earth, from that water supply to this glorious sunshiny spot, where it has been tapped and piped; and the water rises up to an elevation much higher than the tallest Fuscata shrub, so that if any person should so desire he could layer a branch on the top of any of the shrubs and water it with water piped from the artesian water supply. And the flow of this supply can be made to periodically turn the water on or off, according to the need, by the weight of some water flowing into a bucket on a balance to operate a valve. If you own any land plant a Fuscata bush, if only for the pleasure of having such a sweet and attractive bush growing in your garden, for some day it will more than repay you for your trouble. This beautiful flowering shrub is in all probability better known throughout the northern part of this country than any other of the many attractive plants of the south. There is a great demand for the white blossoms in the large cities of the north. This plant was given the name of Gardenia, from Alexander Garden, M. D. of Charleston, S. C., who was a correspondent of Linnaeus, according to L. H.. Bailey's cyclopedia of American Horticulture. Under the name of Cape Jasmine, the Cape of Good Hope history records, is its native place, and no doubt that is why it was called the Cape Jasmine. It is an evergreen shrub with ridgy, pointed leaves, some 5 and one-fourth inches long and 2 and three-eighths inches wide. 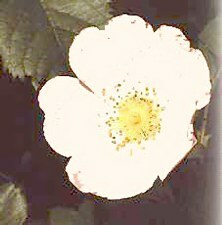 The flowers are pure white and about three and one-half inches in diameter. The petals of the flowers look as if they had been cut out of white broadcloth, without any of the waxy look of the Japonica flower. If the weather is nice and warm the blossoms will begin to appear in the month of April, if the bush is out in the open. 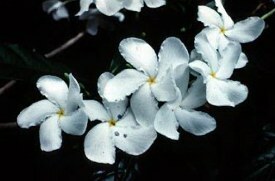 Some of the magazines state that the Cape Jasmine blooms throughout the summer. It would be a very profitable plant if it did, but it does not, and a very few weeks sees the last of the flowers on most of .the bushes. The flowers turn yellow before they wither and die. A few of these attractive flowers on a bush a few weeks is sufficient compensation for the little care and attention they require. The flower has a perfume which is very delightful to many people. This Jasmine is one of the easiest southern flowering shrubs to propagate from cuttings or layers. The branches grow out from the root and they can be easily bent down in the ground after a little of the bark has been removed where the branch is sunk into the ground and held down with a stone or a brick. Care must be taken to remove a part of the bark only on one side of the stem, for if it is not removed the wound is liable to heal, and it will take a very long time to root. Only a part of the bark must be removed. The remaining bark is left to sustain the life of the stem until it is rooted, and then it can be cut away from the mother stock but must not be removed for sometime thereafter. Cuttings can be rooted easily if set in soil, that can be kept wet by the continuous flow of water from some source and nothing can excel I our artesian water supply for that purpose. In the springtime some of the leaves of the Cape Jasmine bushes turn dark yellow.. This has not been accounted for. The changing of the color of some of the leaves does not seem to lessen the beauty of the flowers or in any other way effect the plant. If more attention is given to this subject it might lead to the elimination of this blight, from this otherwise most attractive and profitable flowering shrub. Not very long ago a great man in his line, was invited to a reception, and he would not attend except on condition that the ladies attending would all refrain from using any kind of perfume. It is gratifying to know that nature did not stipulate that the beautiful flowers of this earth when they blossom forth as they do year after year must leave their fragrance in their floral Boudoir and not bring it with them for fear some one will object. As for me they can bring their perfume with them. What would springtime be if the flowers all forgot to spray themselves with perfume before they came out? Could we sing that old song "Land where the odor of sweet scented flowers, etc.," with any feeling at all. 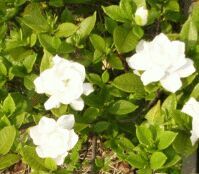 A lady perfume maker told me a few days ago that she made the Cape Jasmine perfume from the Cape Jasmine flowers and that she had a field of Cape Jasmine bushes from which she obtained the flowers. It is not hard to visualize a "great field of Jasmine bushes out in the angle of land bordered by the Bay of St. Louis and Pass Christian, in flowering time, ready to be taken to the perfume factory, or to be packed in dainty boxes to be shipped to the many flower lovers where the Cape Jasmine do not grow. "From the Greek Azales dry." "Linnaeus believed them to grow in a dry location." -Cyclopedia of American Horticulture. The Azalea is a specie of plant belonging to a very large family of pretty flowering shrubs found in some places on both continents. The Heath, Rhododendron, Wintergreen, and Huckleberry shrubs have been put in this class by some great Botanists. The Azalea we know here is said to have come from Asia. When the writer was a small boy he gathered Azalea flowers from bushes growing along the shell road by the side of the canal from New Orleans to Lake Pontchartrain. That Was a swampy wilderness then. It was inhabited by alligators and lots of other wild life. It did not take the flower loving travelers long to get them, root and stem and where could they have taken them to? For Azalea bushes up to but a few years ago were not often to be found in the gardens around there. A gorgeous display of Azalea bushes in flower, a sight worth seeing, has been seen in one of the gardens on St. Charles Avenue in New Orleans for many years. 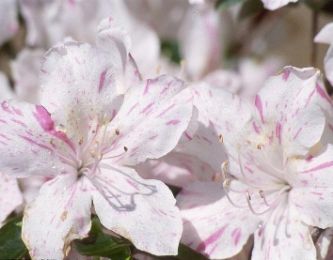 The Azalea, some authorities tell us can be grown from seeds if planted in rich soil. Layers, if properly put in the ground and carefully attended to, and not allowed to get too dry in the long dry spells of summer, is a sure way to propagate Azalea. Although an authority writes that it requires at least two years for a layer to make enough roots to sustain the stem after it is cut from the main stock and transplanted. Many places around this country are famous for great displays of Azaleas in blossom, they deserve to be, and should be proud of the reputation they have for being such flower lovers. 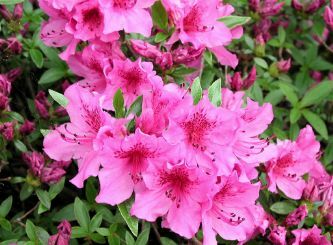 The writer's experience with growing Azalea dates back to only four years ago when he bought a pink and red flowering Azalea at two-fifty each. They were only eighteen inches high. The pink one died, then he bought two more, one for five dollars and the other ten. They did not seem to do very well on the exposed east side of the house so he transplanted them to the West side, where it is somewhat shady, to see if they will thrive any better. He bought another Azalea bush three weeks ago. It was four feet and eight inches high and four feet across. The price was fifteen dollars. He planted this big bush near the others and now it is sending out many buds, and new leaves. The Azalea seems to have picked out all of the colors of the rainbow to color the blossoms of its many varieties. It would be interesting to see a Royal purple colored flowering Azalea. It is said they are to be had with flowers of that color. If that is so, it will not be long before there will be one growing around here, if there is not one already en~ throned here, decked in its Royal Purple robes. "Richarda Africana," as the Botanical name implies, is a native of South Africa. It is called the "Lily of the Nile" Linnaeus. 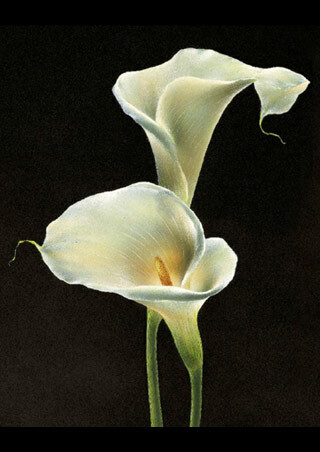 The Calla Lily, as we know it, is a perennial bulbous rooted plant. It can be grown here in the open ground under the partial shade of a moss covered oak tree, if planted where it will be protected from the cold winds from the North, and from the gales from the South, by clumps of trees, and so that it can get plenty of air, and not be thrashed down by every little breeze that makes living so enjoyable along this Coast. When the nice warm weather comes in April or May it can be depended on to send out blossoms as fine as most flowers of that kind that have been grown in a greenhouse. If a flower lover should ask the writer to suggest some plant to buy that would give the greatest amount of pleasure, and be suitable for decorations for any occasion, at the smallest cost and least amount of trouble, the Calla Lily would be recommended. The roots can be purchased now for thirty-five cents each. It is well to buy several and plant two or more in different places. In this way, it can be determined which is the best location in which to grow them. There are some Calla lilies growing around here now amid surroundings as given above, and they look as if they had had the protection of a greenhouse over them, but they have had only the sheltering branches of moss covered trees, and they came through those cold spells of the winter without having had one leaf frozen. If the cold should freeze the tops it will hardly cause them any delay in their blossoming. This is the writers experience in this locality, but he would not want anyone farther North to expect the same results. "Consider the Lilies, how they grow, they toil not, neither do they spin; and yet I say unto you, that Solomon in all his glory was not arrayed like one of these." – St. Luke, 12:27. That wonderful arrangement of words places the lilies in an exalted position in the plant kingdom, and so it makes it easy for us to conceive that the Calla lilies were the lilies that were intended for us .to study. The eyes would never tire looking at that beautiful picture of white, green and gold. The story has already been told that if the face and hands are anointed with the odor of a Calla Lily blossom, they will be immune against the stings of honey bees. Perhaps if this plant is considered more closely it might be learned that it has a power to immunize us from many other stings of this world. The Night Jasmine is a very delicate shrub and it can~ not stand the cold weather. The first frost will kill it down to the roots when it is growing in the open, but in the springtime it will send up several slender stems from four to five feet high, and later on it will send out a number of. clusters of very small trumpet shaped and yellow colored flowers. At nightfall these minute blossoms seem to spray the surrounding atmosphere with a most delightful odor. From this nocturnal habit of throwing out its fragrance, it is called the Night Jasmine. It produces small ivory like seed berries which are exceedingly ornamental and they remain on the bush until frost. 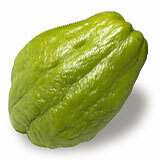 It is a native of the East Indies, but it can be grown in this location to perfection. They can be grown from seeds or propagated from cuttings, or by the division of .the roots. It is a shrub you can plant in your garden and forget it, if you want to, but it will not let you forget it, for when the flowering time comes it will send you a perfumed message that it is still there.